I am honored to be participating in the Summer Surprise blog tour. Sofilantjes gave me a copy of this pattern to sew up. I could choose to sew a mash-up, sew it like it is written, or alter it in some way. 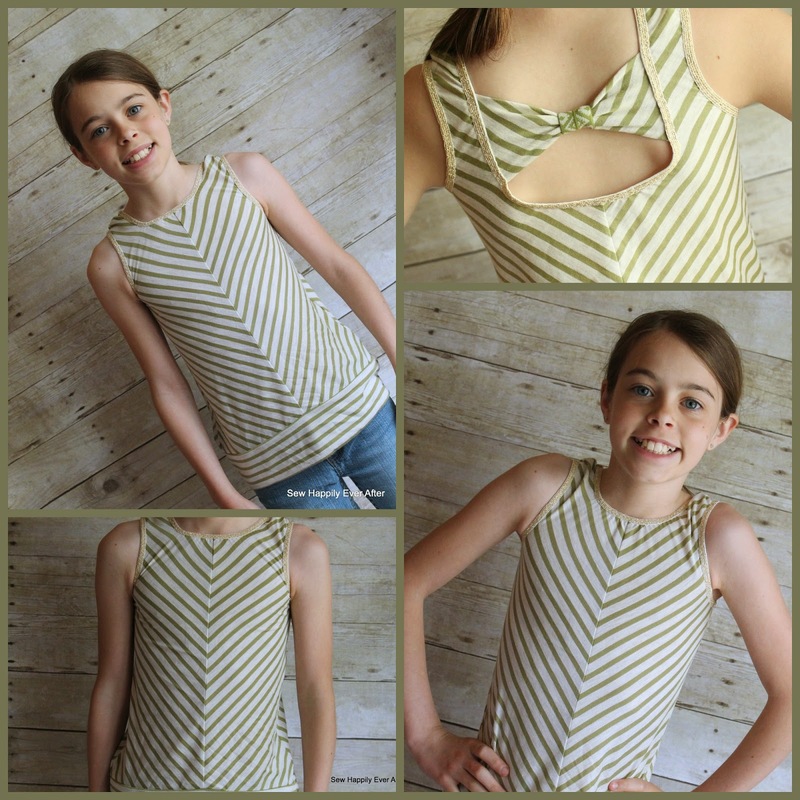 I chose to sew the top version in a slim size 8 (hooray for slim sizes!). I couldn't decide on what fabric I wanted to use and stood staring at my stash for quite a while, but nothing jumped out at me. Then I went to my up-cycle basket, and pulled out this adorable striped shirt. It was on sale last summer for $1 and was a size 3X. I knew it would be used for something eventually. I was even able to use the cool bottom hem, which was a bonus, because I didn't have to actually hem the shirt AND it looks like I added a band to the bottom of the shirt. Also the 3X blouse was already sewn in the chevron pattern, so I didn't even have to figure out how to do that! All in all the summer surprise is a really quick sew. I finished the neck and arm bindings with FOE (fold over elastic) from my stash (making it an even quicker finish). In preparation of the anniversary of this pattern, the pattern has been completely updated and is being re-released in a new format. Nothing has changed about the pattern itself, just that the layout may have changed a bit. The new pattern will be automatically uploaded to your account, if you had previously purchased it from the website. If you have previously purchased a copy of the pattern from Etsy or either won or tested the pattern and would like to have the new copy, send an email to info@sofilantjes.com with proof of your original purchase. Write "summer surprise" in the subject line. 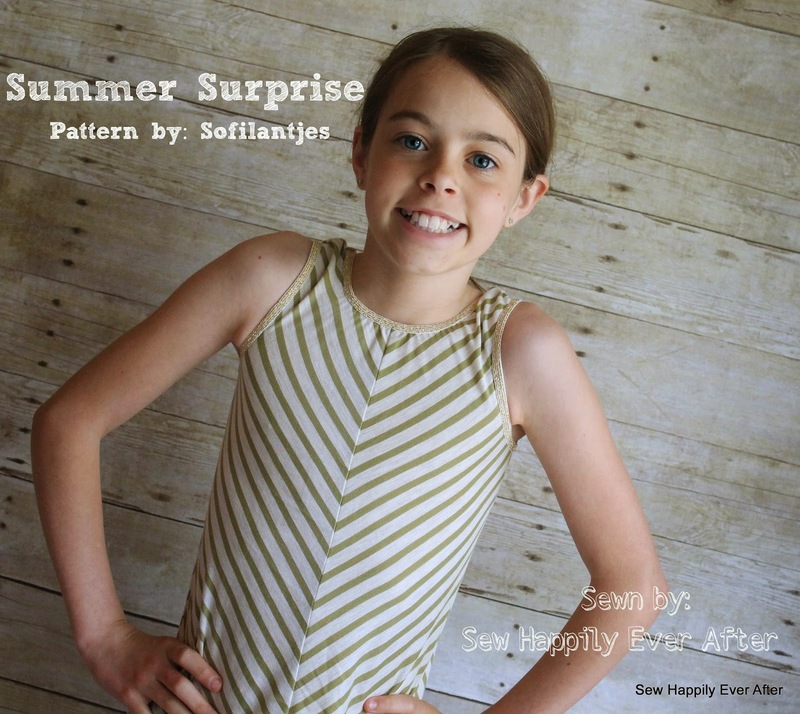 Don't forget to hop on over to Sofilantjes and buy your Summer Surprise pattern. Here is a generous 25% discount code: anniversary (only good through May 30, 2015). What will you create for your Summer Surprise? Want to follow along with the Summer Surprise blog tour? Each of these amazing seamstresses and bloggers will be participating. Be sure to visit them all and don't forget to leave some comment love! Don't forget to enter in the amazing giveaway for a chance to win some fantastic prizes! Really cute. I love the gold. Happy Anniversary! Love that shirt! !